Only need 1 shirt? No problem, email your request for pricing on smaller quantities. Value! 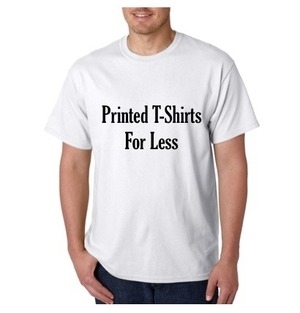 Printed White T-Shirts for Less. Email your breakdown and quantity for each size. Please note : Additional $1.75 for XXL and Larger will be added to your order. VALUE PRICE for 144 shirts or more! Adult 100% Cotton, 5.3 oz White T-shirt printed with one-sided print, one-color. Add .99 for second side/ .35 for second color/ Heavy weight t-shirt that is comes in a huge variety of colors. Holds up well and will barely shrink. Contact customer service for multi layout and large quantity discounts. Have our in-house art team create your design or logo.